Many of us keep a record of the movies we watch. Few of us, however, lead the free world. As the reliable sales numbers of presidential biographies (no matter how thick) attest, the actions of the President of the United States of America, no matter who that President may be and no matter what sort of actions that President takes, always draw interest. For instance, you may have seen that Paleofuture's Matt Novak recently went through Jimmy Carter's diaries to draw up a list of every single movie Carter watched during his Presidency. "Part of my fascination with the movies that presidents watch is just cheap voyeurism," Novak writes. "But the other part is an earnest belief that popular culture influences things in the real world. President Nixon was obsessed with the film Patton during the Vietnam War. President Reagan urged Congress to take computer security seriously after seeing War Games in 1983." 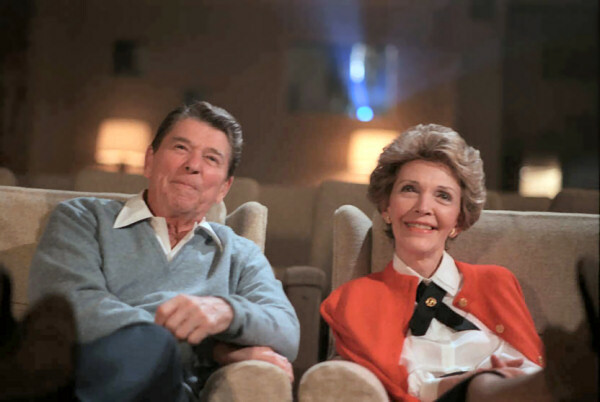 And you can learn what else they watched by pulling up What Nixon Saw and When He Saw It by Nixon at the Movies author Mark Feeney, and the list of films Mr. and Mrs. Reagan viewed from the Ronald Reagan Presidential Library. Nixon watched several depictions of hard-bitten heroes (and antiheroes) toughing out their troubles: not just Patton, but Bullitt, True Grit, Ice Station Zebra, Our Man in Havana, The Treasure of the Sierra Madre, Spartacus, and Lawrence of Arabia — with the occasional Paint Your Wagon or Auntie Mame thrown in there as well. Carter hewed a bit closer to the overall American cinematic zeitgeist, watching such era-defining films as Rocky, Network, Star Wars, Airport '77, Annie Hall, Animal House, The Last Picture Show, Apocalypse Now, Alien, and 10. Reagan, famously a film actor himself, watched all sorts movies, though his list shows a certain preference for military-themed spectacles like Gallipoli, Inchon, Das Boot, Firefox, Red Dawn, Iron Eagle, and Top Gun, as well as sports pictures like Breaking Away, The Winning Team, and even Knute Rockne, All American, in which he himself portrayed football player George Gipp, a role that anointed him with the nickname that would stick until the end. The Freedom of Information act assures us that we'll have the chance to study the in-office viewing habits of many presidents to come. Novak, in fact, has already put in a request for the lists from George H.W. Bush, Bill Clinton, and George W. Bush: "They said I can expect the list in 46 months." Well, the wheels of government do grind slowly, after all — we've learned that from the movies. Below you can find a list of the first 10 films each president watched upon taking office. The difference in their cultural sensibilities immediately leaps out. Nice list, thanks for the share ! Which movies did all 3 of them watch?